Set amidst a sea of verdant rice paddies in the hills of Ubud, Bodag Mailah is one of the island’s most inspired restaurants, with healthy organic meals prepared from produce grown at the adjacent Sari Organik Centre. 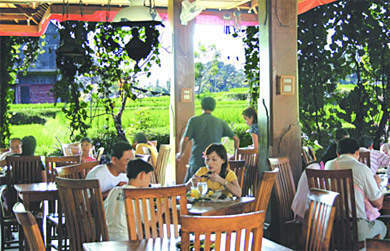 A second restaurant has now opened at Suly Resort and Spa, a tranquil yoga and retreat centre in Mas. The pairing of Sari Organik with Suly Resort and Spa makes perfect sense; an organic coop that supports local farmers and a whole host of community projects, working with a wellness resort that provides support and training for Yayasan Bali Global Charitable Foundation – a local NGO that provides education for underprivileged children. The name Uma alas translates as ‘rice fields and rain forest’ and we find plenty of both in this quintessential Balinese setting that also incorporates tropical gardens, stone statues and a traditional style pavilion housing the restaurant. 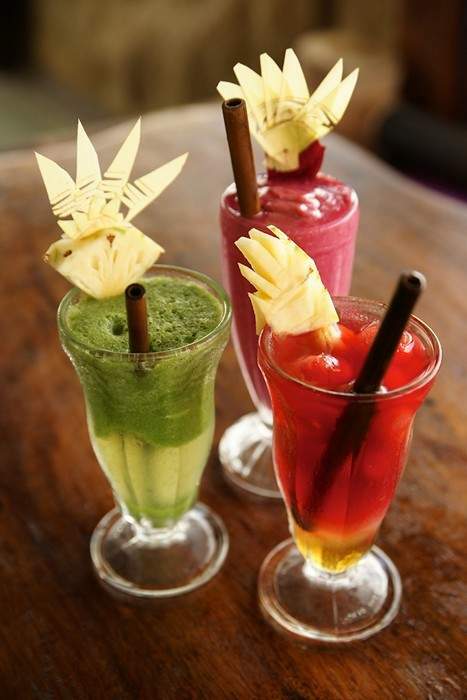 Fresh juices are colourful and brimming with vitality; the fluffy Pink Treat is the exact shade of the flourishing frangipani in the garden, with pineapple, mango, mint, beet, sweet potato and honey creating a thick, sweet loveliness. While the Green Cleanser is as vibrant as the lush leafy foliage surrounding the restaurant, with its blend of broccoli, tart apple and silky honey. Sari Organik is also well known for its homemade wines with tropical flavours like dragon fruit, mango, and passion fruit which can be bought by the bottle or mixed into cocktails. We start lunch with a Romantic Salad. Nothing beats organic vegetables picked fresh from the garden, with the crispiest of leaves, the juiciest shredded carrots, sweet tender beets and crunchy red pepper. The side of homemade beet mayonnaise is fluffy and delicious, and the home baked bread has a wonderful earthy flavour with just a hint of caraway seeds. The Grilled Greek Vegetable Salad is full of flavour with an abundance of fresh herbs scattered over lightly grilled vegetables, topped with soja feta cheese (no animal products) and served with crinkle cut chips. Our next dish favours tofu – one of those ingredients that is incredibly bland on its own, but can be transformed into almost anything. The Tofufalafel is a shining example – actually I don’t think I ever tasted tofu this good, thanks to middle eastern seasoning and thick crunchy outer layer. It comes with big fat grains of organic rice (red and white) and urap made with lightly cooked vegetables tossed in spicy coconut milk. The Sari Organic experience is always a pleasure, with wonderfully innovative juices and healthy and nutritious food that tastes great. A visit to the centre and to the original restaurant, Bodag Mailah is also highly recommended. Guests are welcome to explore the farm which specialises in growing organic vegetables and rice, and also produces jams, wines and cheese. Getting there is half the fun, a 15 minute walk along a narrow trail across the rice fields.